Miami Heat president Pat Riley has a long history with the Los Angeles Lakers. Riley served as an assistant coach for three seasons in Los Angeles before being promoted to the head job — which he held from 1981-90, leading the team to four NBA championships. The Hall-of-Famer played for the Lakers from 1970-75, too. Naturally, after Magic Johnson abruptly stepped down as the Lakers’ president of basketball operations this week, Riley has been linked to the head job in Los Angeles. While he said he spoke with Johnson after the surprise decision, Riley said he has no interest in returning to the West Coast. He wants to finish his career in Miami. 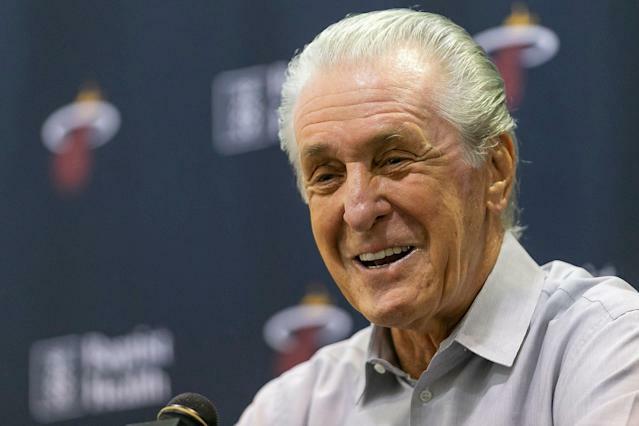 Even though Riley has a lengthy history with the Lakers, he has a similar history in Miami. Riley coached the Heat from 1995-2003, and then again from 2005-08. Riley was named the team president in 1995, too, and has led the team to three championships — once as a coach in 2003 and twice in the front office in 2012 and 2013. With that level of success, there isn’t much of a reason for the 73-year-old to make the switch to Los Angeles at this point — especially with the state of the Lakers’ organization. After reaffirming his commitment to Miami, Riley said his focus is now on bringing the Heat back to the championship level they were once at. Miami finished this season with a 39-43 record and missed the postseason for the third time in the past five years — something Riley isn’t happy with. While he said it took some time to recover after bringing in LeBron James and Chris Bosh to join Dwyane Wade and form the “Big Three” — a move he said he’d do again — Riley said he still believes the Heat are an attractive landing spot for players in the league. He feels the team is “at the launching pad” now, and can still bring in the pieces needed to succeed in South Beach in the near future.